Researchers create the ultraslippery coating by making a glass honeycomb-like structure with craters (left) and coating it with a Teflon-like chemical (purple) that binds to the honeycomb cells to form a stable liquid film. That film repels droplets of both water and oily liquids (right). Because it’s a liquid, it flows, which helps the coating repair itself when damaged. A new transparent, bioinspired coating makes ordinary glass tough, self-cleaning and incredibly slippery, a team from Harvard University reported online July 31 in Nature Communications. The new coating could be used to create durable, scratch-resistant lenses for eyeglasses, self-cleaning windows, improved solar panels and new medical diagnostic devices, said principal investigator Joanna Aizenberg, who is the Amy Smith Berylson Professor of Materials Science at the Harvard School of Engineering and Applied Sciences (SEAS), a core faculty member at the Wyss Institute for Biologically Inspired Engineering, and professor of chemistry and chemical biology. The new coating builds on an award-winning technology that Aizenberg and her team pioneered called Slippery Liquid-Infused Porous Surfaces (SLIPS)—the slipperiest synthetic surface known. The new coating is equally slippery, but more durable and fully transparent. Together these advances solve longstanding challenges in creating commercially useful materials that repel almost everything. 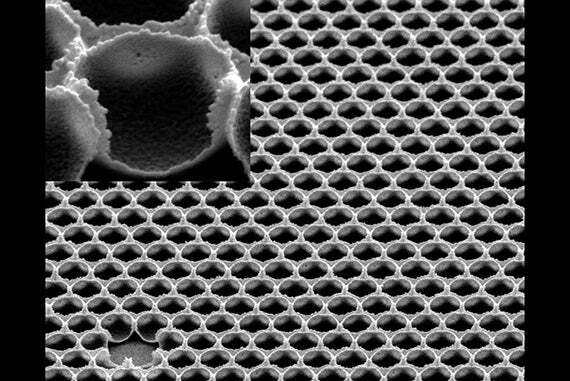 The tiny, tightly packed cells of the honeycomb structure, shown here in this electron micrograph, make the SLIPS coating highly durable. SLIPS was inspired by the slick strategy of the carnivorous pitcher plant, which lures insects onto the ultraslippery surface of its leaves, where they slide to their doom. SLIPS’ thin layer of liquid lubricant allows liquids to flow easily over the surface, much as a thin layer of water on an ice rink helps an ice skater glide. (See video.) Unlike earlier water-repelling materials, SLIPS repels oil and sticky liquids like honey, and it resists ice formation and bacterial biofilms as well. Aizenberg and her colleagues sought to develop a coating that accomplishes this, but extends those capabilities further. The new SLIPS design surpasses existing coatings, which can be quite robust but not slippery or transparent, or, alternatively, transparent but not mechanically stable or repellent enough, Aizenberg said. “The SLIPS-like coating is mechanically stable and has a long-lasting performance as a slippery surface because it’s composed of a sturdy honeycomb-like structure that holds lubricant in tiny, container-like pits,” said lead author Nicolas Vogel, a postdoctoral fellow in applied physics at SEAS. To create this coating, the researchers corral a collection of tiny spherical particles of polystyrene, the main ingredient of Styrofoam, on a flat glass surface like a collection of Ping-Pong balls. They pour liquid glass on them until the balls are more than half buried in glass. After the glass solidifies, they burn away the beads, leaving a network of craters that resembles a honeycomb. They then coat that honeycomb with the same liquid lubricant used in SLIPS. Applying the SLIPS-like coating to glass slides confers unmatched mechanical robustness. Slides treated this way withstood damage and remained slippery after various treatments that can scratch and compromise ordinary glass surfaces and other popular liquid-repellent materials, including touching, peeling off a piece of tape, and wiping with a tissue. These glass slides with the SLIPS coating also repelled a variety of liquids, just as SLIPS does, including water, octane, wine, olive oil and ketchup. And, like SLIPS, the coating reduced the adhesion of ice to a glass slide by 99 percent. Keeping materials frost-free is important because adhered ice can take down power lines, decrease the energy efficiency of cooling systems, delay airplanes, and lead buildings to collapse. By adjusting the width of the honeycomb cells to make them much smaller in diameter than the wavelength of visible light, the researchers made the coating completely transparent. The researchers were also able to apply the SLIPS-like coating to glass slides in a pattern that confines liquid to specific areas—an ability that’s important for various lab-on-a-chip applications and medical diagnostics. “We set ourselves a challenging goal: to design a versatile coating that’s as good as SLIPS but much easier to apply, transparent, and much tougher—and that is what we managed,” Aizenberg said. The team is now honing its method to better coat curved pieces of glass as well as clear plastics such as Plexiglas, and to adapt the method for the rigors of manufacturing. This work was funded by the Advanced Research Projects Agency—Energy (ARPA-E), the Air Force Office of Scientific Research, and the Wyss Institute. Nicolas Vogel received funding from the Leopoldina Fellowship program. In addition to Vogel and Aizenberg, the research team included: Rebecca A. Belisle, a former Wyss research assistant who is now a graduate student in materials science and engineering at Stanford University; Benjamin Hatton, formerly a research appointee at SEAS and a technology development fellow at the Wyss Institute who is now an assistant professor of materials science and engineering at the University of Toronto; and Tak-Sing Wong, a former postdoctoral research fellow at the Wyss Institute who is now an assistant professor of mechanical and nuclear engineering at Penn State University. "The system is designed to be moved, changed, and adapted,” said Ecaterina Dobrescu of modular rooftop planters at Gund Hall that will reduce the quantity and speed of stormwater running off the building’s roof.